I want to start out by saying I met Miranda a few years back, we were both taking an online picture book class. Then we ended up at Whispering Woods (an amazing picture book retreat with Jill Esbaum and Linda Skeers) and were bathroom buddies. She was working on this manuscript then, and it was really good. I knew she would go far. Miranda is an amazing person with a huge heart. She will change the world with her writing. And is already making a difference in the lives of authors with Rate Your Story. I asked her if she would do a blog post figuring I could ask her lots of deep and intriguing questions. She said yes, but she wanted to do a playlist. What is more deep and intriguing then a glance into someone’s music preferences? And she wanted it published today because of the significance. It’s Happy Gambian Independence Day. So please welcome my guest blogger today, Miranda Paul! I hope you are as inspired by Miranda as I am. Although it’s usually young adult authors who come up with unofficial “playlists” for their novels, I wanted in on the fun. Music is a big inspiration to me, and this book is one that tells the story of an entire village where life is changing for the better. 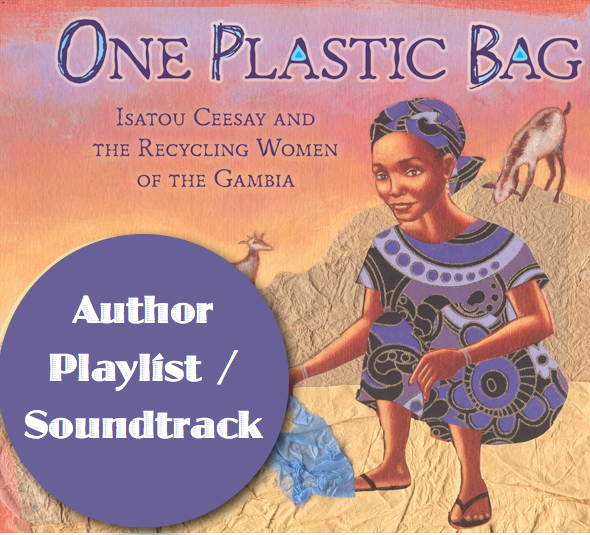 Here is a list of songs that I listened to while writing and revising One Plastic Bag, or gearing up for the book launch this weekend at my local B&N. This video and version of the song, remade for the 2010 World Cup, is one of my go-to tunes for inspiration. One Plastic Bag was released during the same month as the Gambia celebrates its 50th Independence Day (Feb. 18, 2015). Flags are a symbolic way to rally or unify people, and this song reminds me of the Gambian flag whose colors (red, blue, green, white) stand for the sun, the river, the forest, and peace. This music video, though filmed in Botswana, reminds me a lot of Gambia — from the “gelly gelly” public van taxis to the ingenuity of making toys out of available items to the traditional dancing. The message of “thinking outside the box” coupled with the infectious drum-beats never fails to get me jazzed up and inspired to work on a project. It’s hard for me to listen to it and not get up and dance. Years before I’d written One Plastic Bag I worked in the fair trade industry. Habib Koité’s CD came into my possession during that time and his Bambara background and language reminded me of stories that Isatou had told me about her grandfather and his sister, who had fled violence in Mali. This and other CDs became ways for me to connect to the sounds of West Africa in between travels there. This video shows the strength of one voice and the powerful simplicity of a heartfelt message. The lyrics, which state, “We are here for all of us” remind me of how Isatou speaks when she lays out her vision for Njau, for Gambia, and the future. Just as Isatou works in Gambia to get people talking about tough issues, Alicia Keys also does in this song. It reminds me that making art — books or otherwise — is a reflection of both the outside world and our inner hope. Miranda Paul has been an avid recycler since elementary school, when she won a contest by transforming a discarded cereal box into a beautiful holiday ornament. She still loves rummaging for treasures but now spends most of her time teaching and writing. 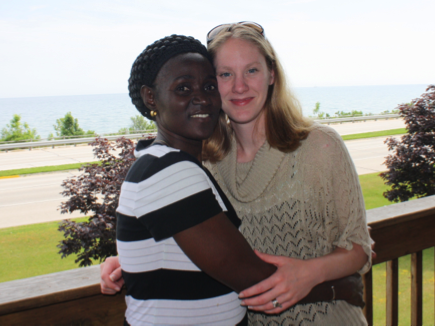 Over the past decade, Miranda has traveled to the Gambia as a volunteer teacher, a fair‐trade and literacy advocate, a freelance journalist, and more. 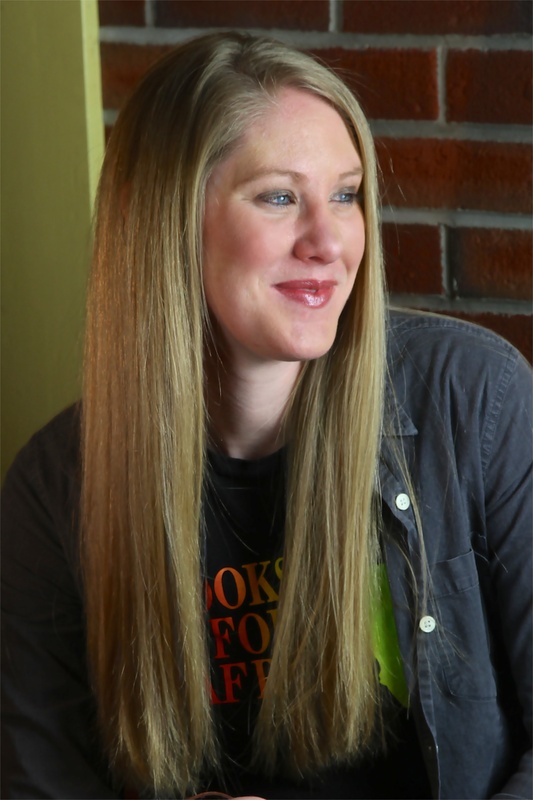 Miranda lives in Green Bay, Wisconsin, with one husband, two kids, ten bookcases, and a hundred new ideas. Find her online at www.mirandapaul.com and find out more about this book at www.oneplasticbag.com. « Debut Author Interview, Mardi Gras Style! Enjoyed the interview and the videos. Best wishes on the success of your book! Thanks, Patricia. Glad you liked the songs. I’ve been playing them on and off all day! Great interview! I’ve been listening to the Nico & Vinz album on repeat recently…. have you seen the picture book by K’Naan called “Wavin’ Flag”?